Even though summer is coming to a close, I find myself still in full-swing grilling season. The nights are getting shorter and the days are starting to get cooler. Those are my favorite times to cook over fire. While I tend to lean towards hearty steaks, stews & chilis during the fall and winter months, there is this awkward time in the beginning of September where I want hearty summer grilling food. We are in that awkward September time of year, so I decided to grab myself a bag of Cowboy Charcoal and do Grilled Shrimp Tacos. Now you might be thinking that Grilled Shrimp Tacos are just summer food, but you would be wrong. When you pack them full of chipotle powder, onions, cilantro & red cabbage then you’d think twice about having them all year round. Grill them right over the hot Cowboy Charcoal so they get a nice caramelization & smoky flavor. I like to cook a lime half at the same time as the shrimp. This will heat up the lime, make it a little smoky & allow me to squeeze that juice on top of the Grilled Shrimp Tacos once they are done. The key to this Grilled Shrimp Taco is cooking the corn tortillas right. I like to place two tortillas on top of each other right on the grill. Let them cook for 30 seconds per side to heat up and be fresh. Using two tortillas allows the corn to get crunchy on the outside & soft on the inside. Makes for that perfect bend in your Grilled Shrimp Tacos. 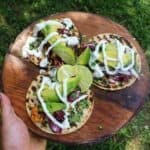 Layer that taco with onion, cilantro, red cabbage, avocado, & sour cream for a savory & zesty flavor throughout the meal. On the grill! Lets dig in! 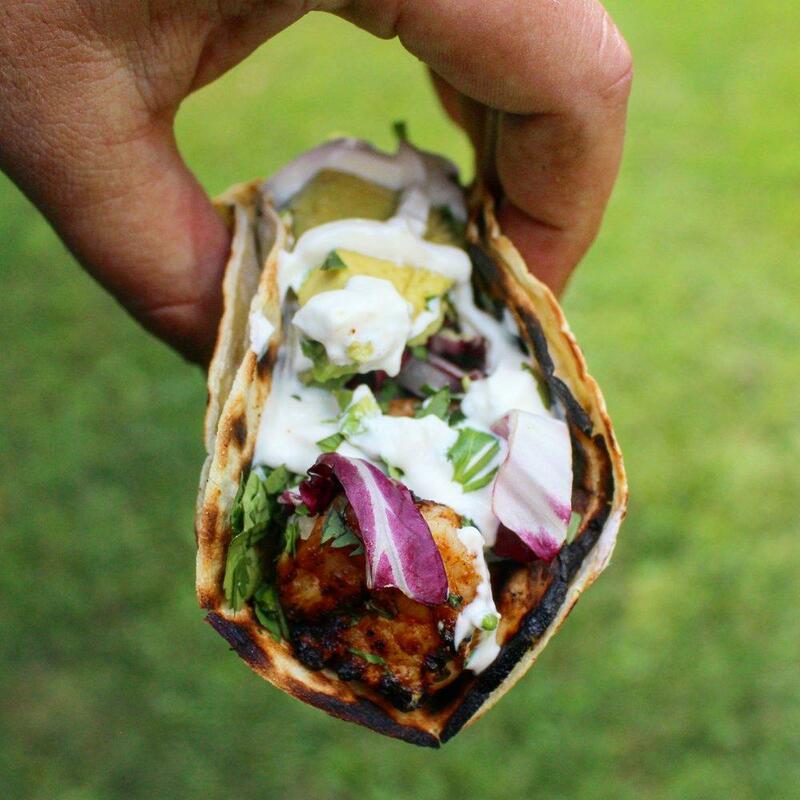 Try some delicious grilled shrimp tacos over some hot Cowboy Charcoal. They are sure to make your grilling a night to remember all year round. In a bowl, add the shrimp, chipotle powder, onion powder, & fine sea salt. Squeeze one half of a lime on top, add a couple pinches of cilantro and mix thoroughly. Place shrimp on grill and let cook for 2 minutes per side. Pull off once done. 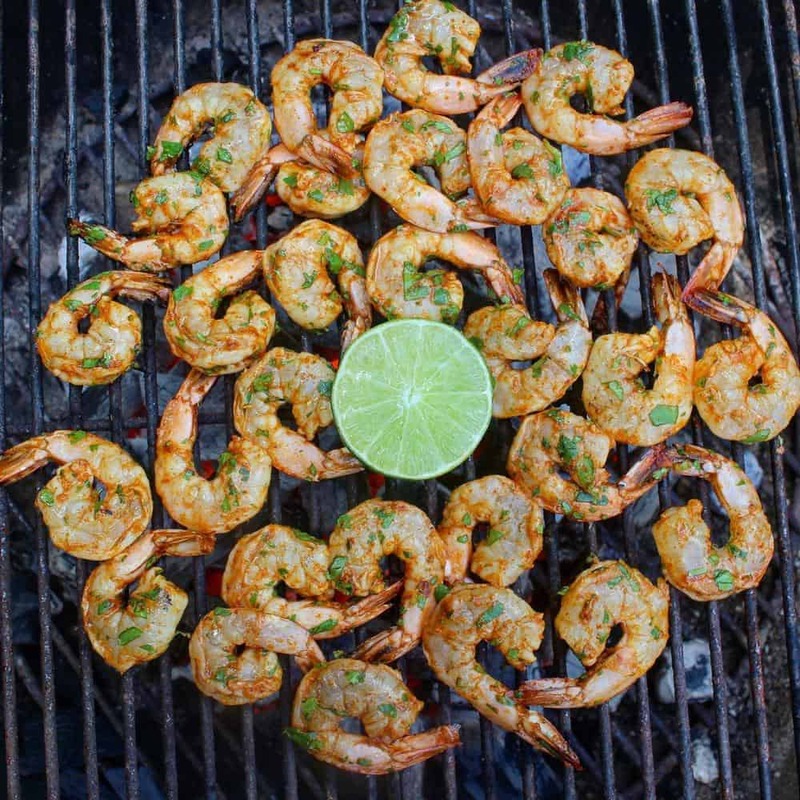 When shrimp are done, place corn tortillas on grill for 30 seconds per side to heat up. Tip: Place 2 tortillas on top of each other and place on grill to. This will give you a crunchy outside with a soft inside. 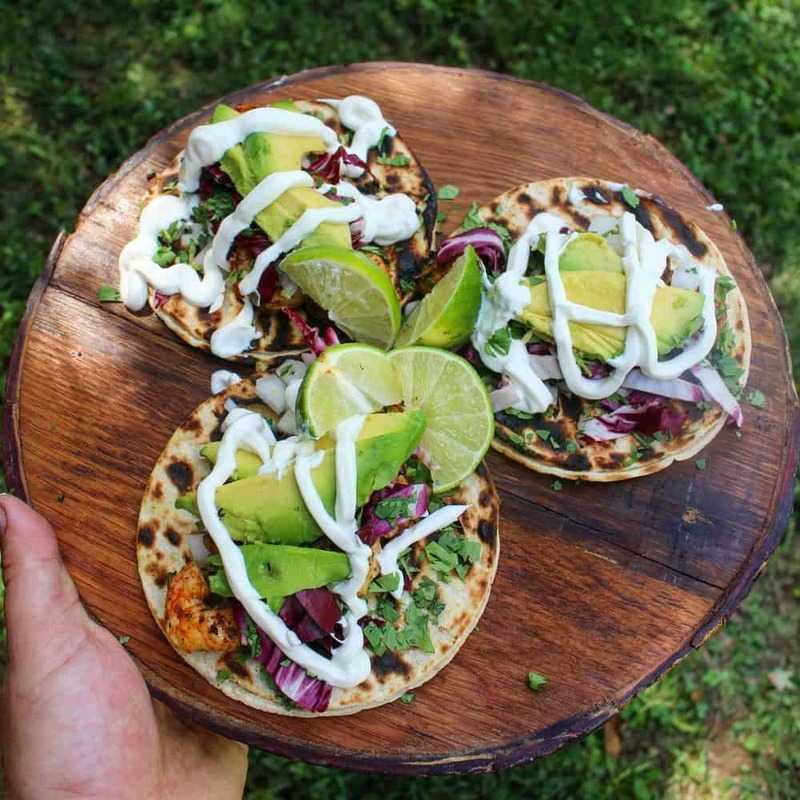 Layer tacos with tortilla first, shrimp without tails, onions, cilantro, red cabbage, sliced avocado and sour cream if desired. Add lime wedges to the side for more flavor. Equipment Needed: Cowboy Charcoal, grill, tongs, bowl, and fire starters.